First up is this interesting spell for the Kitsune Honor deck, Chikushudo’s Trickery. 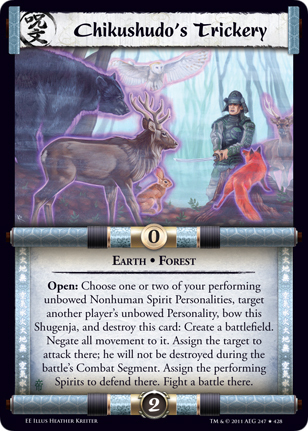 An open action that forces one of your opponent’s personalities to attack and you get to assign 2 Nonhuman Spirits to defend. So I get to kill you guy, gain some honor, and do all this on your opponents’ turn? 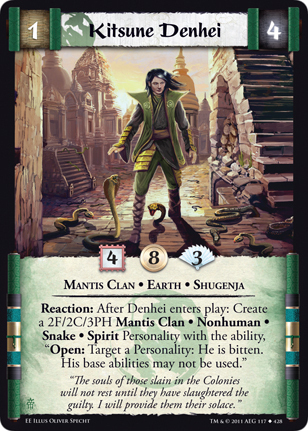 Kitsune Denhei has an interesting pet spirit…a snake with 3 personal honor? No one tell the Chuda that. The ability on the Snake is very strong. 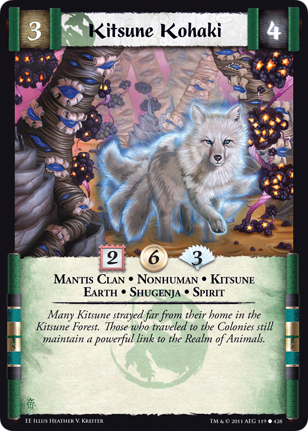 Kitsune Kohaki is the first Nonhuman Spirit for the theme that is actually a Shugenja also. A 3/4 for 6 with 3 PH too? Wow. Moshi Yokohime is the Soul of Moshi Yuriko from Empire at War. Not bad but not great either. Her usefulness will depend upon how many useful cards (without attachments) there are to bow which will probably be a lot. Paid Off is also a reprint from Empire at War. 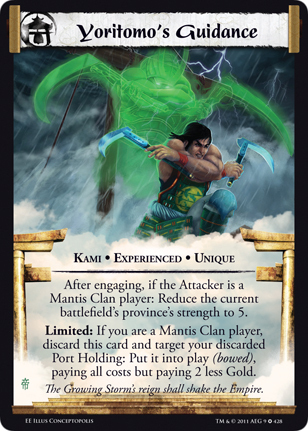 Kalani’s Landing and probably Yasuki Dishonor / Control will get some use out of this. 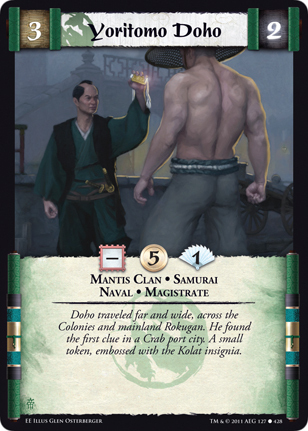 Funny, I read that card title and think that card should have the Kolat keyword or have a picture from the Godfather on it. 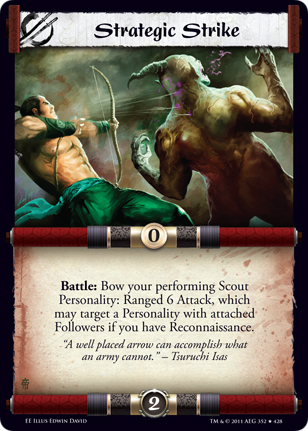 Sniping is a reprint from the Soul of the Empire expansion. 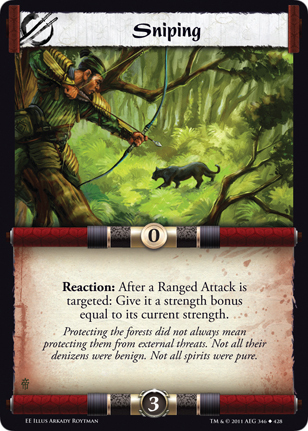 Doubling the strength of a ranged attack sounds like an awful good card to me but then again I’ve been shooting stuff down with ranged attacks since 1999 when I started this game. 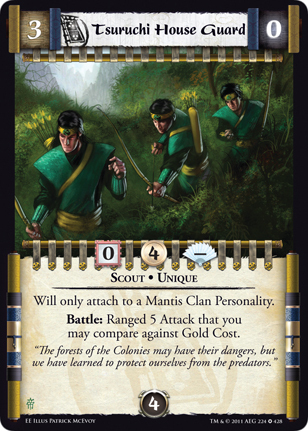 Mantis, Crab scouts and Kaiu engineers, Scorpion Ninja, and Phoenix shugenja are some of the themes who will probably pack this card. Strategic Strike is a reprint from Path of the Destroyer. It’s not quite The Arrow Knows the Way but I am quite fond of what this card will do. 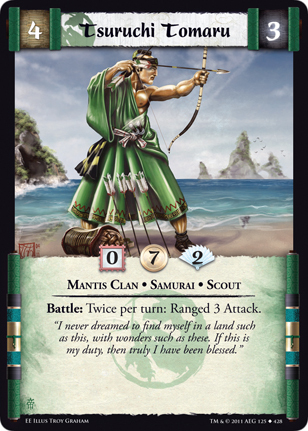 Mantis, Crab, Crane, and Lion scouts will all get use out of this card. Tsuruchi House Guard is packing death from several hundred yards away. Range 5 kills a lot anyway but it also has the option to compare against gold cost. With the economic warfare theme, this could trigger more than you would think. Tsuruchi Kosoko is the Soul of Tsuruchi Saya from Imperial Gift I. If you want your personalities to bring death with them to the battlefield without having to play other cards to do it, you might want to pack Kosoko. Granted there is no naval keyword but still she should not be overlooked. Tsuruchi Tomaru is also a nicely costed personality. Two possible kill actions and the scout keyword. Out of Koshin Keep, you might want to keep your eyes open for those arrows…too late. 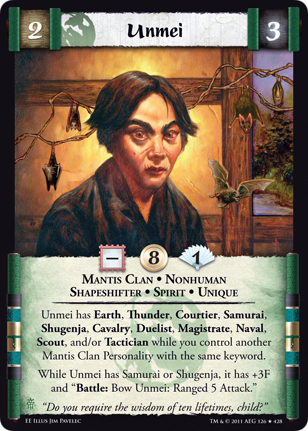 Unmei is a reprint from Dawn of the Empire expansion. He gained and lost some keywords from his original printing which is good for the current environment. The other change? Well if he is either a Samurai or Shugenja he gains both abilities. The original version he had to be both to gain both actions. 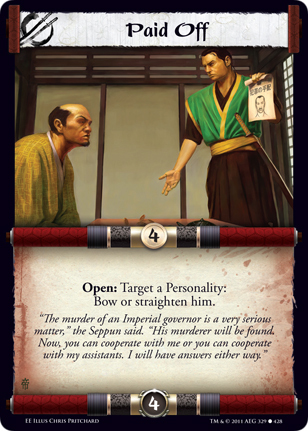 Yoritomo Doho is a new Magistrate for the Econ Warfare theme. I would have preferred to see Yoritomo Eihiko back since Doho is only interesting since he is trying to find clues about the Kolat. My question is, what is the Kolat insignia? 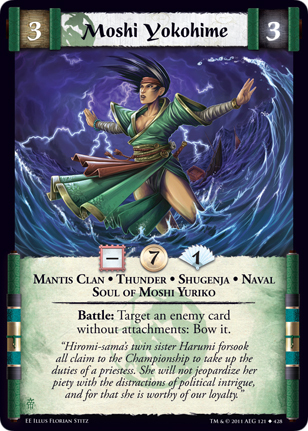 Yoritomo’s Guidance Experienced may not be as broken as the original but it is just as brutal for an opponent to deal with. Yoritomo will simply not be denied conquering your opponent. 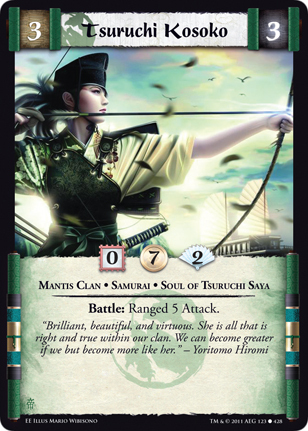 Emperor Arc, Emperor Edition, Five, Kitsune, L5R, Legend, Legend of the Five Rings, Magistrate, Mantis, Moshi, Naval, Preview, Rings, Scout, Shugenja, Spirit, Tsuruchi, Yoritomo. Bookmark.